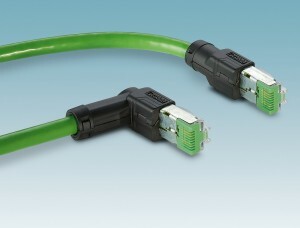 Up until now, it was only possible to assemble the Profinet cable using the Quickon RJ45 plug connector with insulation displacement connection. This is because in the office environment, RJ45 connectors are used with cable cross sections in the range of AWG26. However, this is not sufficient for Profinet cabling. Here, a cable cross section of AWG22 or 0.34 mm² is required. The crimp connector is available in an angled version to address special installation requirements. The corresponding patch cables for applications involving SERCOS III or EtherCat are comparable. These only differ by sheath color or marking on the corresponding cable.